I have been discovering that one of the best places to find maternity clothes is my husband's closet. I am lucky to have married someone who loves fashion as much as I do, and his closet is one of my favorite places to raid these days. (I've actually been told several times I should feature him on the blog, which is always a thought for the future.) Between the v-neck sweaters and endless number of button downs overflowing his closet, they seem to be a perfect fit for my growing bump. Here I styled one of his shirts with skinny black jeans and threw on a boyfriend blazer for extra warmth. I finished the look with OTK boots and pearls to add a feminine touch to an otherwise masculine look. Pearls are popping up everywhere this spring and I couldn't be happier to pull mine out of my jewelry box as I love their timeless presence and femininity. I bought this dress the other day and will be wearing it throughout my pregnancy. I love how easy it is to throw on, and how it can be styled casual for day or dressed up for evening. It would also be perfect with a blazer and pumps for the office. These fleece lined footless tights by Plush are my new favorite item. They are the most comfortable tights I have ever worn, and since they are lined with fleece they actually keep me warm during this never ending winter. Plush also makes them in maternity and to all my pregnant readers, I highly recommend them. Happy Valentine's Day! Does anyone have fun plans to celebrate? Mike and I don't usually make a big deal out of Valentines Day, but tonight we decided to go out to dinner. In case your wondering what to wear or need to grab a last minute gift, here are some outfit ideas and items that fit the occasion. Whether your getting together with a husband, significant other, or close group of girl friends, I hope you all enjoy your day. 1. Although a lot people think it's cliche, you can never go wrong with a red dress. I love this one from Alice and Olivia. 2. This CaseMate iPhone case gives you a little sparkle every day. 3. What's better than one Chanel color? Three. Chanel Trio Nail Polish Set. 5.These Alexis Bittar Golden Pave Crystal Drop Earrings would look great dressed up or with jeans. 6. A red lip is perfect for Valentine's day. Dolce and Gabbana Lipgloss. 7. I've been obsessed with this Elizabeth and James Cynnie Sling Bag. Love this pale pink color and also comes in red! 8. A printed skirt and crop top makes a romantic outfit. Especially love this skirt and top from Tibi. If you're wondering what shoes you'll need to be adding to your wardrobe this spring, one style that is a must have is the mule. 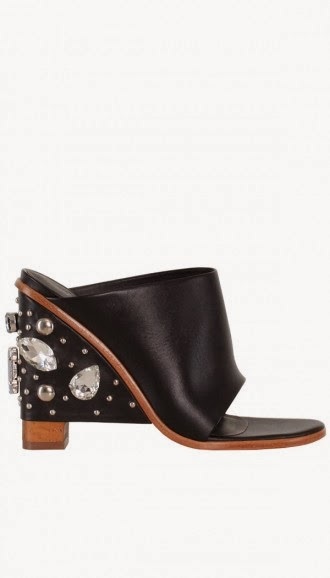 I especially love this pair by Tibi. Just recently noticing them after seeing fashion forwards sport them on the streets of NYC for fashion week, I instantly fell in love. 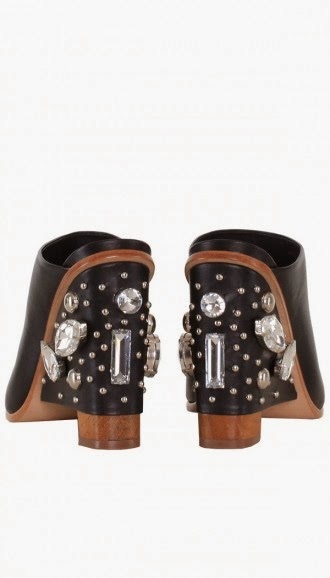 The mix of wood, leather and crystals are perfect and I'm hoping to add these to my wardrobe very soon. It's time I get to share some exciting news with everyone: my husband and I are expecting twins this summer! We couldn't be happier or more excited. I guess I can't hide the bump anymore as I'm showing earlier than I thought I would. And not because I've been carb loading.... well maybe a little due to the nausea in my first trimester... but mainly because there are two in there. Being an identical twin myself, I share such an amazing bond with my sister and it melts my heart knowing the bond that these two babies will share. I truly feel blessed. However, I know I am up for a challenge while dressing as I constantly get bigger, and my goal is to still be able to wear all the must have items for spring. Okay, I won't be attempting cropped tops, but I couldn't be happier that sneakers are so in this season! Although my goal isn't to turn this into a maternity blog, Threads for Thomas is about my personal style so I will spend time discussing maternity dressing and sharing my personal outfits while trying my best to style my growing belly. However, I am looking forward to the spring/summer collections hitting the stores and will still be covering all the top trends for this spring and summer, items everyone must have, clothing lines I love, and sharing beauty products I can't live without. And of course with fashion month starting this week, I will be covering all my favorite shows from NYFW, and what we can expect to see this fall. Since this is my first pregnancy, I am learning as I go along and would love to hear from you if you have any favorite stores for maternity shopping or products you would recommend. I will also be sharing frequent outfit photos on my Instagram so if you want to see more bump style follow me @rachaeltleung.